Kimi Raikkonen is under no illusions that he will be able to repeat his Belgian Grand Prix victory in the remaining races of the season. The 2007 world champion gave his Ferrari team its first win of 2009 at Spa, after a race-long battle with then Force India driver and now his team-mate Giancarlo Fisichella. But despite his breakthrough win, Raikkonen believes it will be hard to repeat the feat, as Ferrari has already shifted its focus to 2010. 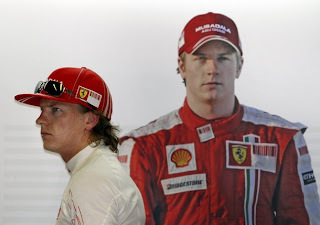 "We knew that it was not going to be easy," Raikkonen said of winning in 2009. "We are still not where we want to be, and we are not going to be, because we are not going to put any more new parts in the car. "We will try to win more races, but we know it's not going to be any easier, as everybody else will be putting new parts and we are not. "I think it depends a lot on the circuit and the conditions. We will try our best and see where we end up." The Finn also downplayed the advantage the KERS-equipped cars are expected to have at Monza this weekend. "I don't think so," he said when asked if he expected the six KERS cars - Ferrari, Renault and McLaren - to dominate the race. "There are other cars that can be very fast, as we've seen in many other races this year. Hopefully we can be in the front, but I still think it's going to be very close between the teams." Raikkonen denied his win in Belgium had given Ferrari reasons to retain him next year, as he made it clear he is not going anywhere despite speculation about his future. "I think they know what I can do from what I've done. The results sometimes don't give you a true picture. I always say I'm not worried about my future. I have a contract, and it's not going to change whether I'm last or first. "Of course I want to win, it's good for me and for the team, but for the future it makes no difference. "I wouldn't have a contract if I didn't want to drive." Kimi-Matias Räikkönen born 17 October 1979) is a Finnish racing driver. After nine seasons racing in Formula One, in which he won the 2007 Formula One World Drivers' Championship, he competed in the World Rally Championship in 2010 and 2011. In 2012, he returned to Formula One, driving for Lotus and continued to drive for Lotus in 2013. On September 11, 2013, Ferrari announced their signing of Räikkönen on a two year contract, beginning in the 2014 season. Kimi's new boat according to Iltalehti.